The past few weeks my computer has been acting up by crashing all of a sudden. Both of my monitors freeze and then my PC restarts by itself. When this happens, I can't do anything, the Caps-Lock key won't respond and I just have to wait for the restart. When checking Event Viewer, the only issues that show up regarding the crash/freeze is "Kernel-Power" Event-id 41. I've tried using the "Whocrashed" application, but it never creates any Crash Dumps as it can't find the issue. In the beginning, I thought it was my PSU that was the issue, so I replaced it with a newer one since that didn't work, then I sent my GPU for a maintenance-check and received a new one... still the same issue. I have tried completely wiping my C-drive and took out both of my RAM units too see if they could cause it, but alas no such luck. Recently I have checked my Task Manager in the "Start" tab and noticed 4 strange programs. One of them called "Program" that is a file-type and three of them called "Update" that are .exe programs that were activated that I have never seen before. When right-clicking them, the only action I could do was "Search online" and not check their file location. I have never seen these before and I have had my PC for a few years now, so I do not know if this is anything Windows-related or something that isn't supposed to be there that I should worry about. One last thing I would like to add is that every time I start my PC and open a program (Chrome, Steam or Origin) it freezes for 2-3 seconds and then resumes the task. Neither have I experienced this before. I don't know what to do and I am completely lost and starting to become desperate. I do not know if it is a hardware-related issue or a virus I can't find in my antivirus scans. I am sorry for the long wall of text and for my English, as it isn't my main language. If more information about my system or the issue is required, then I will gladly add that. I hope someone can help me with this, as these crashes are worrying me. I have the newest Windows version installed (1809). Initially would sound like PSU - I am deducing that you said you replaced the PSU and still have the same problem? Does the freeze still occur in safe mode? It probably could be the PSU but it just seems so unlikely. I have replaced my previous PSU that was 650W, with a 850W. The issue still happens with the new PSU. I will try going into safe mode when I get home later today. When trying to go into safe mode, I forgot to do it. When I was on my lock-screen and misclicked on "Slumber" instead of "Restart" I pressed the restart button when it was slumbering and it suddenly stopped working and a blue light showed on my motherboard. I could turn on the PC but nothing showed on the screens at all, and after around 20 seconds, the PC shut down by itself. I later unplugged everything and replugged the cables and turned on the PC, which ended up in my PC working. I then tried going into safe mode and let the PC stay idle for around 2 hours, with no issues. That may not be enough, so I will be going into safe mode tomorrow for a longer period of time to see if any issues persist. Firstly, what light appeared on your motherboard when it wouldn't boot? Secondly, have you updated your BIOS to latest version? The light that was showing on my PC was blue LED. It didn't blink, it was constantly turned on until I tried turning on the PC where the light then disappeared for a while, before it then came back up when the PC forced itself to shut down. My current motherboard is MSI X99A SLI Plus and I do have the newest version installed, if I remember correctly. I booted up the PC in safe mode yet again today for 2 hours, and I have experienced no hiccups or crashes when using it. 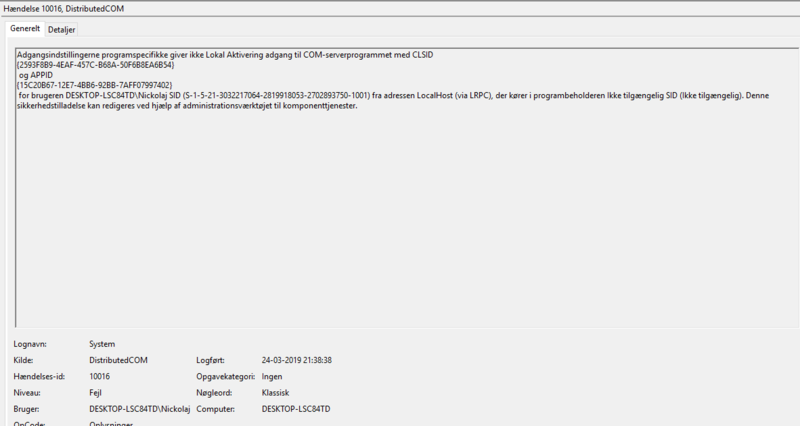 Also, while the PC is running check Reliability History/Manager and Event Viewer. Either one or both may be capturing some error code or warning relevant to the hiccups or crashes. It doesn't mention what hardware could be the cause for the issues, but I hope this is useful information. It is in Danish, so I hope it is possible to understand what is going on. If a translation is needed, let me know. The light that was showing on my PC was blue LED. Are you able to see what LED it was using your motherboard manual? That may tell you what the light is indicating. If it is a debug light, it will illuminate when a hardware problem is detected. If it isn't occuring at all in safe mode, it would sooner indicate software error. It could well be a device driver that's causing the hardware error notification. Are you able to get a minidump and post it? The CLR_CMOS1 LED was the one showing blue but I can't find anything in my motherboards manual about it at all, sadly. Currently, I haven't experienced the LED issue since yesterday. I can't find a minidump on my PC either. I am not sure how to enable that feature on my PC, as I can't find it on Windows Settings where the guides are leading me to enable it and find minidumps. I have now enabled Minidump on my PC, hopefully, it will be generated if my PC crashes again soon. Use Event Viewer to look for similar errors (15e ?) or warnings that occur just before or at the time of the freezes. May be worthwhile to again shutdown, upplug, open the case, and reseat all cables, components, RAM, jumpers, etc..
Clear the logs and keep Minidump enabled. Hopefully there will be no more crashes. However, if there are additional crashes, the captured information will "stand out" and provide some indication of what is going wrong. After 3 days without any issues, my PC crashed again when speaking in Discord and opening a game on Steam. Currently, there seems to have been no minidumps created at all for some reason. I was told by some of my friends to use WIN+R and type "perfmon /report" to see if there were any hardware issues after the crash, which I did. No issues were detected, from what I can tell, but I am not experienced in this. Are there any Windows programs or third-party programs I should use to help me? Reliability Monitor shows nothing about the crash that happened recently for some reason, only Event Viewer. You can use the built in Windows troubleshooters. And you can also use "sfc /scannow"" (without quotes) via the CMD prompt. Another thing that can be done is to reinstall Discord. DCOM is 10016 has been a long time issue. Some websites dismiss it as a meaningless error. I do not consider a system crash as meaningless. Overall, I am very skeptical about third party programs that claim to fix problems. Those programs are likely to show up no matter what the given problem is. Alright gotcha. Currently running "sfc /scannow"
This issue happened when Discord wasn't installed on my PC either, but I can try doing that again. I will try using the other troubleshooters on Windows. sfc /scannow found corrupt files and repaired them. Hope that will be enough, but I am a bit doubtful. PC crashed again after opening up a game and letting it idle for a few seconds. Reliability Monitor shows no errors that have occurred today. Event Viewer shows DistributedCOM happening 2 minutes before the crash yet again. Computer screen freezes when i interact with my second monitor while gaming, hard restart required.